청자 쌍사자형 베개(靑磁 雙獅子形 枕)는 고려 중기에 만들어진 청자 베개로 높이 10.5㎝, 길이 21.8㎝, 너비 8.2㎝이다. 모서리를 둥글게 깎은 직사각형의 판 위에, 두 마리의 사자가 서로 꼬리를 맞대고 머리로 베개 위판을 받치고 있는 모양이다. 사자는 각각 암수를 나타낸 것으로 보이며, 눈은 검은색 안료로 점을 찍어 생생하게 표현했다. 베개 위판은 연잎을 형상화했으며, 잎맥이 예리하게 새겨져 있다. 표면은 맑은 비취빛 광택이 흐르고 부드러우며 은은한 색조를 띈다. 12세기 전반에 전라남도 강진군 대구면 사당리 일대 가마에서 만들어진 것으로 보인다. This is a porcelain pillow from the mid Goryeo Dynasty. It is 10.5 cm high, 21.8 cm long and 8.2 cm wide. It shows a pair of lions standing with their tails touching each other and propping up the upper panel with their heads. The lions are placed on a panel with the corners cut round. They seem to represent a male and a female. Their eyes are shown by dots painted in black, which makes them look real. The upper panel of the pillow is made in the shape of a lotus leaf, with the veins of the leaf sharply carved in. 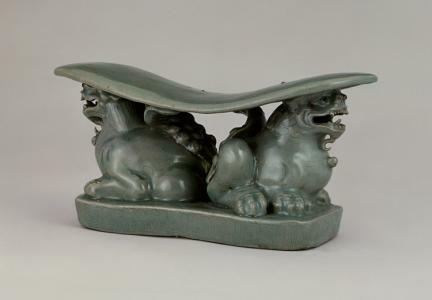 The surface of the pillow is covered with crystal clear jade green gloss of a soft and misty color. This piece seems to have been made in the area around Sadang-ri, Jeollanam-do during the first half of the 12th century.